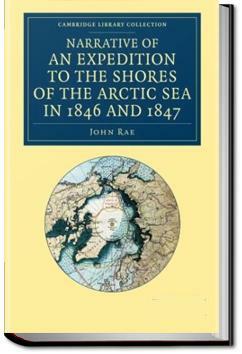 After the bizarre death of Thomas Simpson, Dr. John Rae was chosen to complete the survey of the Northwest Passage, linking the work of Simpson and Peter Dease with the previously known country to the east. Rae was recognized for his endurance and skill in wilderness travel, adopting the methods of the native peoples often eschewed by other European explorers. This is his report on the initial work in the years 1846-47.
. . .welve miles distant, bearing north; but there was not a pool of open water visible. It was evident that our detention in the lakes had as yet lost us nothing. Returning at 8 P.M., I sent four men in two parties to endeavour to discover the best route, one party being ordered to trace a considerable lake in a N.N.W. direction, and, if possible, discover its outlet. 30th.—The men sent off last night returned between 1 and 2 this morning: those who went to the N.W. reported that there was a small stream flowing towards the Arctic Sea from the farthest extremity of the lake they had traced.